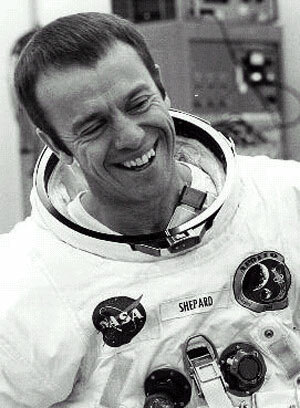 Alan Shepard was one of the original Mercury Seven astronauts and the first American in space. He piloted Mercury-Redstone 3 (Freedom 7) and served as backup pilot for Mercury-Atlas 9. Shepard was subsequently grounded due to an inner ear ailment until May 7, 1969, during which time he served as chief of the Astronaut Office. Upon returning to flight status Shepard commanded Apollo 14, at age 47 becoming the oldest human to walk on the Moon, and in June 1971 resumed duties in the Astronaut Office. He retired from NASA and the United States Navy in August 1974, with the rank of rear admiral, to become chairman of the Marathon Construction Company of Houston, Texas. Until his death he served on the boards of several companies and was president of Seven Fourteen Enterprises Inc. (named for his two flights, Freedom 7 and Apollo 14), an umbrella company for several business enterprises. He was also president emeritus of the Astronaut Scholarship Foundation, which raises scholarship money for science and engineering students. Shepard received a B.S. from the Naval Academy in 1944. After graduation, he served aboard the destroyer Cogswell in the Pacific and later entered flight training, receiving his wings in 1947. In 1950 he attended the Navy Test Pilot School at Patuxent, became a test pilot there, was assigned to a night fighter unit at Moffett Field, and then returned to Patuxent as a test pilot and instructor. He later attended the Naval War College at Newport, Rhode Island, and after graduation was assigned to the staff of the commander-in-chief, Atlantic Fleet, as aircraft readiness officer.